Sydney was born during March 1893 in Fulham, the son of Edward Charles and Charlotte Bridgland (née Ingram.) His father (who died in 1900) was born in West Malling, while his mother was from Platt. Following Edward’s death, Sydney and his three younger siblings all went to live in Claygate Cross near Crouch with Ellen Ingram, their maternal grandmother. Sydney’s mother decided to stay in London and worked as the housekeeper for her late husband’s brother, who was a widowed civil engineer and kept a house in Lambeth. In his medical, Sydney, then aged 18, was described as being 5′ 7″ in height, weighing 128lbs and having a fresh complexion, brown eyes and hair. He signed up for seven years with the Colours and five in the Reserve and sent to the regimental depot in Canterbury, where he underwent basic training. Several months later Sydney joined the 1st Battalion in Dublin and remained with them until 12 November 1913 when he was posted to India to join the 2nd Battalion. During his time overseas he was awarded his 3rd Class Army Education Certificate and qualified for regimental transport duties. At the outbreak of war in August 1914, the battalion was headquartered in Wellington, which is in the current Indian state of Tamil Nadu. Orders arrived in November 1914 for the Buffs to proceed to the Western Front, and after being relieved by a Territorial unit, they departed from Bombay on the 16th on board the Cunard ship Ultonia. The vessel was old, slow, dirty and horribly overcrowded due to the additional presence of a battalion of East Yorkshires, who were also on their way to the Front. After making a circuitous detour around the South Atlantic to avoid enemy submarines, the convoy of 34 ships arrived in Plymouth on 23 December. Sydney spent a wet, miserable Christmas encamped on downs near Winchester, where the battalion became part of the 85th Brigade in the 28th Division. While at camp he was probably afforded a few days leave to return home before proceeding overseas. On 16 January 1915 the battalion marched to Southampton and embarked for Le Havre where on arrival, they entrained for Hazebrouck. The Buffs first went into the trenches near Ypres on 6 February and discovered that they were in a ‘very bad condition’, with the men having to stand ‘knee-deep in water’ and forced to keep their heads down due to the parapet offering little in the way of protection. The trenches had been dug in a straight line without any traverse and were therefore susceptible to enfilade fire in several key places. Despite being at the front for only a few days, a significant number of men returned from their first time in the trenches with swollen feet and frostbite. The following week, 250 men from the battalion attacked an objective situated on the south side of a canal bank. The first attempt was aborted but resumed the next day, with slightly more success. However, only half of the line was achieved, and the battalion held what gains they had made until a replacement force from the Suffolk Regiment could secure the entire stretch. Due to the mud, it was noted that the majority of The Buff’s rifles were out of action, and had the Germans counter-attacked, they would have been in ‘considerable trouble.’ It is unknown whether Sydney participated in the attack; however, he would have almost certainly been in the support had he not been one of the 250. On 22 April the battalion was involved in the Second Battle of Ypres. The Buffs had recently arrived in St Jean (about one mile east of the city) from Zonnebeke, and bivouacked in nearby fields about four miles back from the front lines. On the first day of the attack, Sydney’s unit would have been able to see a greenish vapour (which was poison gas) creeping over the Allied line, while stray bullets pinged around their heads. The battalion was brought into action on the second day and ordered to assist a Canadian Division at Wieltje, who had suffered heavily on their left flank. The trenches were screened by a hedge which allowed The Buffs to approach undetected, however beyond this was open country, and once deployed, the Buffs came under considerable enemy machine-gun and rifle fire. During their advance, men fell in their dozens, with only two companies of Buffs able to reach the relative safety of an old farm about 400 yards across the battlefield. They took further casualties when the men were ordered to make a dash across fields on their right to help secure three lines of trenches that were being lightly protected by a French unit, and in danger of being breached. They made it, and the remnants of the battalion held the position for several days and were eventually relieved by the 4th Rifle Brigade four days later. After a brief period away from the action, The Buffs faced the full force of the German artillery again at the start of May with an abnormally ferocious barrage beginning at dawn on the 3rd. During the day, Sydney received a shrapnel wound in the back of his hand and sent to Boulogne for treatment at No. 13 General Hospital. Battalion casualties in the thirteen days commencing 22 April were estimated to have numbered almost 700 men. Sydney’s time with the 2nd Buffs had come to an end, and he was immediately sent back to England to recover from his wounds. In late June, Sydney was temporarily transferred to the 3rd (Reserve) Battalion, The Buffs, and spent two weeks at camp in Dover awaiting his next posting. On 6 July, two months after he had arrived back in England, Private Bridgland returned to France and was assigned to the 1st Buffs, which of course was his old unit, and formed part of the 6th Division in France. Trench mortars were used in a variety of defensive and offensive roles, from the suppression of an enemy machine-gun, sniper post or other local feature, to the coordinated firing of barrages. Heavy rain for three days almost incessant. Trenches have become impassable; all movement restricted to the open at night. Even the parapet has fallen in, in several places. All dug-outs fell in, entire time taken up with making dug-outs, digging out banks and stores making new bank store etc. On 29 October Sydney took a two-week transfer to the 26th Trench Mortar Battery before returning to the 38th on 12 November. On 19 December he survived an enemy gas attack while in trenches near Railway Wood, and remained in the Ypres area until mid-March when the battery moved to Zegerscappel in northern France. On arrival, he received training in the use of a new weapon known as the Stokes Trench Mortar which was a light mortar that became highly useful for its portability and could fire a high-explosive shell weighing about 11 pounds at a maximum range of about 800 yards. On 1 April 1916 men of the re-designated 26th Battery, which included Sydney, were assigned to X/6 Trench Mortar Battery and in early August sent to Bertrancourt on the Somme. At the start of September Sydney’s unit was based south of Albert near Méaulte, and working on forward gun positions for the Royal Field Artillery. During the month, the 6th Division took part in two general attacks on the Somme (Flers-Courcelette & Morval) and one in October (Le Transloy), with Sydney probably being involved with some, or all of these battles. By the end of November, the division took over the La Bassée sector on the Loos Salient with X/6 based in trenches running north from the east of Givenchy. In 1917 Sydney probably saw action at the Battle of Hill 70 in April, and then Cambrai later that year. Though scant in general information, the War Diary for this period does give comprehensive statistics of how many rounds each battery fired on any given day. For example, during June 1917 X/6 fired a daily average of about 68 rounds, with 136 being sent over on 2 June alone. Sydney was granted two week’s leave to the United Kingdom on 17 January 1918 while he was billeted in Bapaume, and is likely to have returned to his unit on 4 February. Throughout much of early March, his section worked on a gun pit near St. Leger and remained in a constant state of high alert. In the event of a hostile attack, each pit maintained a stokes bomb which was to be used to blow up the weapons, and prevent them from falling into enemy hands. At 4:30 am on 21 March the Germans opened what would later be known as the ‘Spring Offensive’ with a massive artillery bombardment on Allied lines. Following this overwhelming numbers of the enemy infantry advanced on the Allied lines, with Sydney’s position rapidly overrun and it appears he probably blew himself up while trying to destroy his guns. Without an identifiable body, he was reported as missing in action shortly afterwards. A few days before the offensive began, Sydney had written to his relatives, with the letter being delivered the day after he died. It would be the last time they, or Sydney’s fiancée (a Miss Russell of Sundridge), heard from him. Almost a year later, on 8 February 1919, his fiancée placed an advert in the Kent Messenger, asking for any returning soldiers who had known Sydney to get in touch, particularly those released from the prisoner of war camps. 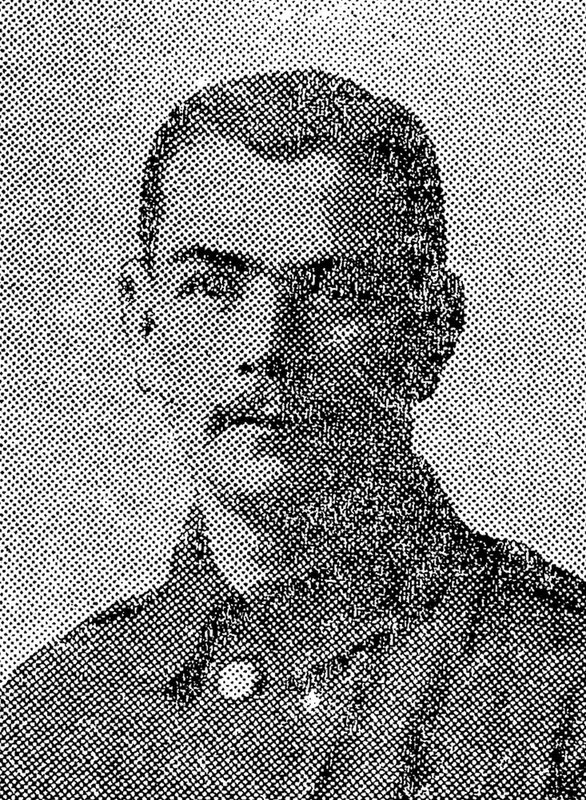 The months of uncertainty came to an end two weeks later when Private Bridgland was recorded for official purposes as ‘presumed dead’ on or before 22 March 1918. His body was either never recovered, or identified later, and he is commemorated on the Arras Memorial in northern France.